Two pipeline men noticed smoke coming from the direction of the shaft and discovered that the North Slope engine room was on fire. When the fire in the engine room was under control, the crew noticed that the timbers and a large number of mine cars on the passing branch were also burning. Victims included 69 miners and four rescue worker who fell victim to poisonous gas, including Joseph E. Evans, who was the Foreman of Federal Rescue Car No. 1. Also killed while attempting to help others were: Walter Knight, mine foreman; Isaac Dawe, fire boss; and John R. Perry. These men rushed beyond the flames to warn others farther in the workings. On April 7, 1911, Joseph E. Evans, foreman miner of Bureau of Mines rescue car No.1, lost his life while wearing a Draeger self-contained oxygen breathing apparatus. 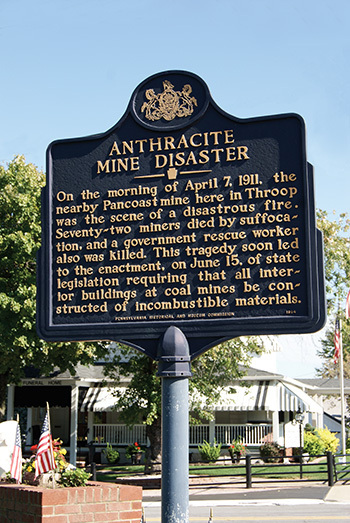 Evans' death occurred during an exploration trip in the Pancoast colliery of the Price-Pancoast Coal Company, Throop, Pennsylvania, after a mine fire in which 72 other persons were killed. Evans and his crew of three men, consisting of one Bureau of Mines employee and two others, an ex-employee of the Bureau of Mines and one other person, had proceeded about 500 feet ahead of fresh air when Evans experienced some difficulty with his apparatus. After leaving one of the men with Evans and advising them to return to fresh air, the other two men proceeded on the exploration trip, returning to the fresh-air base by a different route. Following a brief rest, Evans and his companion proceeded about 80 feet toward the fresh-air base when Evans fell. His companion first examined the apparatus to see that it was functioning properly, and then went to look for the other two members of the party. Failing to find them, he proceeded to the fresh-air base and reported that Evans was down. Shortly thereafter, the two other men of the, party reached the fresh-air base and upon learning that Evans collapsed went to where he had fallen. After adjusting Evan's apparatus, they proceeded to the fresh-air base to obtain additional help. Later they returned with help and brought him to the fresh-air base on a stretcher. The application of artificial respiration and the use of a pulmotor failed to revive him. So far as could be determined, no defect existed in the functioning of the apparatus. Scranton, Pa., April 7. -- One of the most serious mine disasters of this section of mining country occurred today at the little village of Throop, a short distance from this city, when the lives of sixty men and boys were snuffed out. Among those known to have perished are Joseph Evans, who was in charge of the United States mine rescue car; Isaac Dawe, a fire boss, and Walter Knight, a foreman. Evans' death was the result of a defective oxygen-charged armor. Charles Enzian, the expert in general charge of the mine rescue work for the federal government, was also overcome and is said to be in a critical condition. Up to a late hour tonight nearly two-score of bodies had been piled at the bottom of the shaft, but it was thought advisable not to bring them to the surface until the crowd had dwindled. A temporary morgue had been erected at the opening to the mine and here were congregated hundreds of women and children, relatives of the men and boys who had been so suddenly snatched from them. There were pitiful children of tender years clinging to the skirts of their mothers, while older male members of the family sought to soften the anguish of the distracted mothers and sisters. None of the bodies recovered was mutilated, death doubtless having been caused by inhaling flames and gases. The rescuers are pushing into the mine and it is thought all of the bodies will be recovered within a few hours. The fire started in an engine house at the opening of a slope 750 feet from the surface. There were 400 men in the mine when the fire started, about sixty of them in the workings into which the slope led. These sixty were at work in a "blind" tunnel at the end of the slope. Escape was blocked by fire, smoke and the generated gases possibly before the men and boys realized their danger. The other men, scattered in different workings, got out by various exits. James Vickers, a fire boss, tried to get to the tunnel where he knew many men were at work. He could go only a short distance before he was forced to turn back and it was with difficulty he dragged himself through the smoke at the point of the fire. He said no man could live five minutes in the tunnel he had tried to traverse. 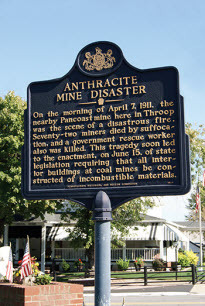 The United States mine rescue car stationed at Wilkes-Barre was summoned early in the afternoon and later the Delaware Lackawanna and Western railroad hospital car and the Lehigh Valley company's mine rescue force from Wilkes-Barre came to the scene. The finding of three bodies led the rescuers to believe that no one was alive in the tunnel and they renewed the attack on the burning area to reduce the awful heat. When this work had proved somewhat effective, a corps of the expert rescue men, with the latest style rescue armor, pushed on into the slope and later came up on several bodies strewn along the roadway. The bodies were carried to the foot of the shaft and stacked up in piles in the narrow space, to be taken out after nightfall, so some of the horror would be hidden from distracted relatives of the victims. The colliery is owned and operated by the Price-Pancoast Coal Company, at the head of which is John R. Bryden, general manager of the Ontario and Western colliers in this region. It is one of the largest and most up-to-date collieries in the region.